A mother black bear is dead and her cubs have been sent to a wildlife park after the bear was euthanized Sunday, May 27 in Lakeside by officials with the Arizona Game and Fish Department (AZGFD). 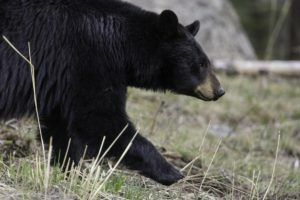 According to a press release issued late Thursday, the female bear had been removed a year ago and relocated about 55 miles away on the Mogollon Rim after she was frequenting neighborhoods in Pinetop. Chris Bagnoli, Pinetop regional supervisor for AZGFD, said three different bears have been spotted in recent weeks in Show Low and Linden as well as Pinetop. It is not totally unusual to see bears in the springtime when they come out of hibernation. Before the monsoons begin, food sources can be scarce. Bagnoli said that the current drought adds to the difficulties wildlife are facing. “That’s just stressing wildlife even more … drought issues are definitely contributing to nuisance issues,” he said in a phone call . People understand that it is a tough time right now for wildlife, and that has led some area residents to try to help them by putting out food and water. “They feel like they’re doing wildlife a favor with food sources,” Bagnoli said. But as the death of the black bear sow points out, efforts to feed and provide water sources is never a good idea.